From the Editor: Bluestockings | LADY. Not that long ago, women who were educated or particularly bookish were referred to as "bluestockings". It was not a compliment and, in fact, was viewed after the 18th century as quite the insult. William Hazlitt, a famous English literary and art critic, said, "The bluestocking is the most odious character in society...she sinks wherever she is placed, like the yolk of an egg, to the bottom, and carries the filth with her." These days, bluestocking is merely an old-fashioned word to throw around when we're feeling exceptionally clever or when we're looking for a really solid literary Twitter handle (it's already taken; I looked). But, in some ways, the sentiment still remains. Women are still feared for the power they might possess and, as writers, our work is taken slightly less seriously than our male counterparts. Jennifer Weiner is a notable critic of sexism in the publishing world. She can often be found debating her Twitter followers on such issues and she gets right to the point, which still appears to ruffle the feathers of many. I suppose that women who take offense and then have to audacity to speak openly about what offends them will always cause this reaction. Because there will always be people - men and women alike - who do not see sexism as a real issue. And now "feminist" has become a synonym for "bluestocking" in a digital world where everyone can share their views and, sometimes, the most viral ones are the least informed. Feminists have fallen into a semantical trap, where people who receive the most page views have an increasingly greater influence over how we experience meaning. Thankfully, women like Jennifer Weiner are undeterred and they are helping female writers make greater headway in publishing by highlighting the negative experiences of women authors. Personally, I haven't experienced sexism in regards to my writing. In high school, I was taught by female teachers who encouraged my creativity. In college, I had male and female professors who profoundly impacted my perspective on what it means to be a writer period. Whether I had two X chromosomes or one X and one Y did not matter to them. All they wanted was for me to work hard, to love what I did, and to do it well by remaining consistent and unafraid. The first element of that equation hasn't proved difficult for me. The second? Well, that's a work in progress. And I think that while I've been fortunate enough to work with only gracious and open-minded teachers, fear is always with me because I am a woman. I've witnessed other female writers have their work labeled as "chick lit" or even the seemingly more innocuous "women's fiction" (if you don't see the problem with this term, perhaps you should go looking for "men's fiction" the next time you're on Amazon) simply because they tackle the subjects of love and family, like many male "literary" works do. I've read books that are deeply intellectual and explore questions of morality and faith but, because their authors are female, have been slapped with covers in shades of lilac and pink and decorated with glitter and handbags. Do we truly believe that women who are well-read, the modern day "bluestockings", are only interested in stories that perpetuate the stereotype of the basic white girl? Because I am, by definition, both a bluestocking and a basic white girl. And both of these terms have been used to make women feel less than what they are, to feel that being a woman means only loving what is traditionally feminine and nothing else. There is no shame in a pink book cover if it fits the story. There is no shame in glittery title if it matches the experience of the characters within. But there is shame in isolating a woman's work, simply because she's a woman, by presenting it in such a way that others might not share it with us. 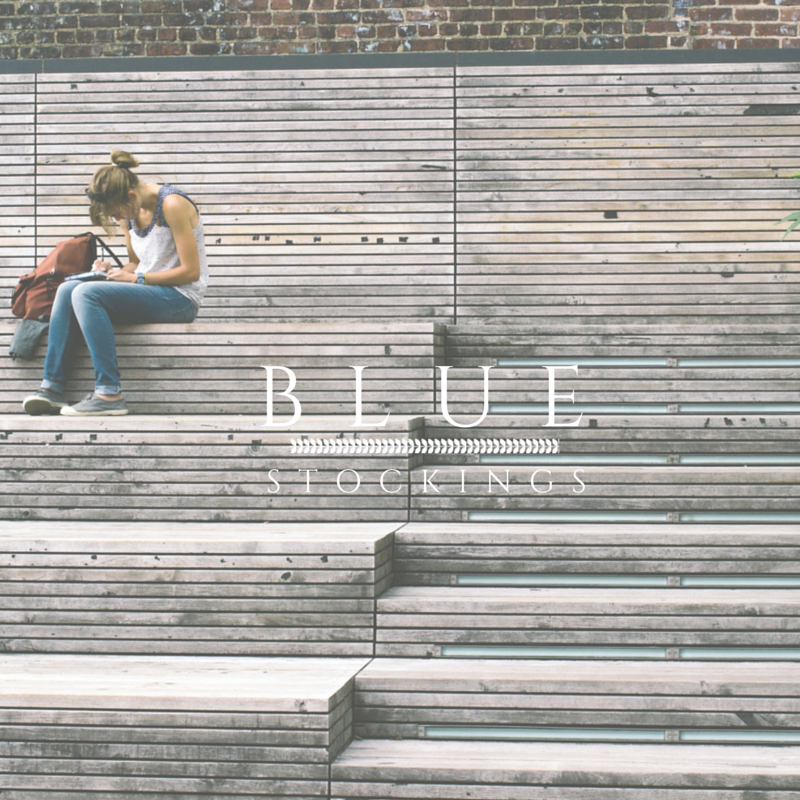 Many people don't know the term "bluestocking". But I do and I love it. I love it because it represents a time when women were just beginning to step out from under the shadows of their male counterparts and speak up for themselves. And while it was once spoken in tones of derision, it's now a picture of how far we have come. Perhaps, it's also a picture of how far we still have to go. And I'm okay with that, fear or no fear. No word will ever make me stop writing. Call me a bluestocking and I'll answer proudly. Call me a feminist and I'll raise my chin and smile at you. Call me a woman or call me a writer, but call me a woman writer and I might punch you in the face. There is a reason why the subtitle of this magazine is "Women. Writers." Because we are both, separately. When it comes to being writers, we are just that. End of story. 2 comments on "From the Editor: Bluestockings"